Shelby Greer, center, is the 2017 Marthaville Good Ole Days Queen and will reign over the festival Sept. 15-16. In front is Toddler Miss Jayla Martinez. On second row from left are Little Miss Atarah Robinson, Tiny Miss Emma Fontenot and Teeny Miss Carleigh Bush. 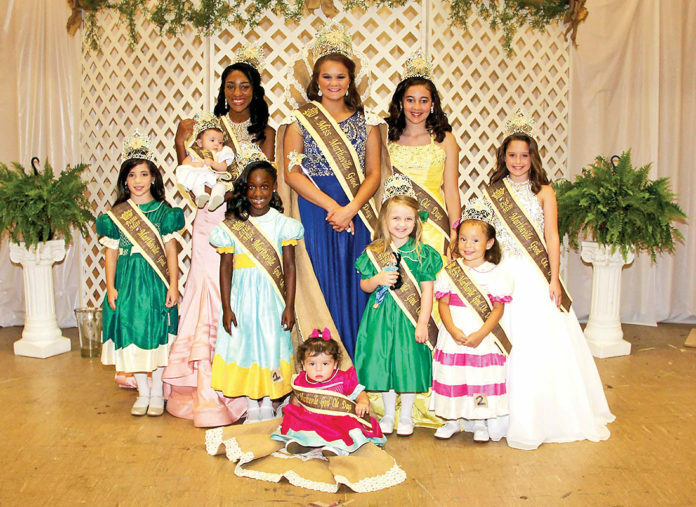 On back row are Petite Miss Carlie Spears, Teen Miss Tayla Mitchell holding Baby Miss Huntar Stoker, Miss Shelby Greer, Junior Miss Jayme French and Deb Miss Abby McNeely. The Marthaville Heritage Society announces the winners of the 2017 Marthaville Good Ole Days Festival Pageant, which was in June with numerous ladies vying for the title. The new Miss Marthaville Good Ole Days, Shelby Greer, will be the official ambassador for the festival and will travel to fairs, festivals, pageants and other events throughout her reign. Greer will also attend the Louisiana Association of Fairs and Festivals Convention and Queen of Queens Pageant in February, where she will network with other queens and board members and compete for the title of LAFF Queen of Queens. Greer and her court invite all to come out the third weekend in September to the “Small Town with a Big Heart” to have a good ole’ time. The winners will reign over the Marthaville Good Ole Days Festival Sept. 15-16 in Marthaville.